Customization available if you need any changes to the program. ActCAD Dial, flow instruments and Scales Automatic Drawing Creation Software. ActCAD software provides with ease of completion of drawing where the user just needs to enter the data, observations, required scales and the software will create the drawing including texts,dimensions with graphs in a Sepia Sheet.This traceable sheet imprints the drawings with accuracy and precision, thus it can be used to directly on a metal sheet for imprinting that drawing. It eliminates the chances of human silly error and accuracy of the drawing is guaranteed. ActCAD Team is also open for customization. If you need any changes to the program, you can contact us for modification. 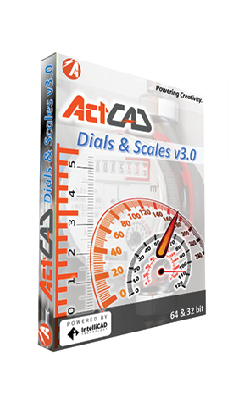 (chargeable) ActCAD Dials and Scales v3.0 can also be used as a stand alone CAD Software where you can easily complete your 2D Drafting. The software is valid for lifetime.